Choose a sliding shower door style below, and explore the different options Dulles Glass offers. 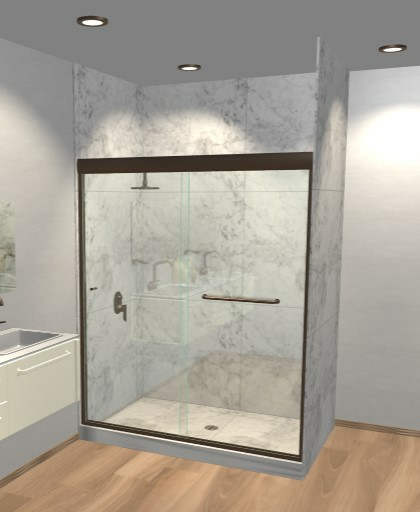 Far from the typical mass-produced sliding shower doors, your new Dulles Glass sliding shower door will stand out from the rest (and are sure to impress!). What makes our sliding shower doors a significant improvement over big box sliding shower doors? Plenty. We start out with premium glass panels in a ⅜” thickness. This is typically thicker than the average sliding glass door. You’ll notice the difference with this size of glass, in the feel and smooth glide of your sliding shower door. Next is the sliding hardware. For our two proprietary shower styles, the Metro and the Quadro shower door, we keep the sliding mechanism to a minimum, so you’re getting a sliding door that’s nearly frameless. The hardware itself it made of high-quality stainless steel and finished in several rich finishes: chrome, brushed nickel, or oil-rubbed bronze. And finally, because of how our sliding hardware is constructed, your door will glide smoothly and quietly for a rich, luxurious feel. You can also customize your sliding shower door with a glass treatment called ClearShield, which will help keep your shower door clean and spotless for years to come. We recommend getting this treatment so that your shower door will remain spot-free with a minimum of effort to clean on your part (and who doesn’t love that?). 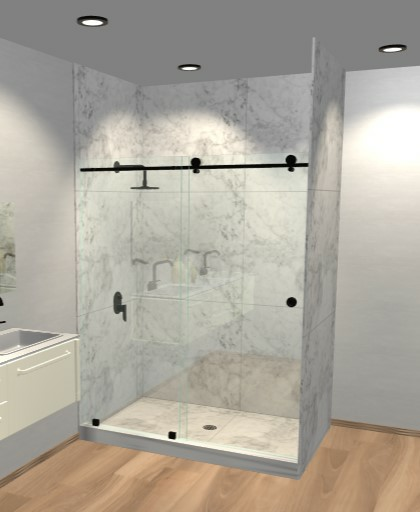 Whether you’re installing your shower in a historic Washington, DC home, or in new construction in Northern Virginia, there are ways that your new sliding shower enclosure is great for saving space. For one thing, the shower door slides open rather than swinging open, so obstacles in your bathroom are not a big concern. Plus, sliding shower doors can usually be installed in the same general space that your prior bathtub occupied, meaning you won’t have to reconfigure your bathroom layout to accommodate a new shower configuration. 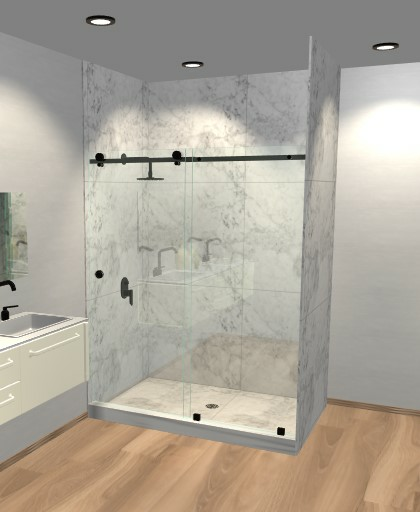 And finally, a Dulles Glass sliding shower door can often be installed over existing bathtubs for an easy, quick, and painless bathroom upgrade. Find out more about our sliding doors for bathtubs here.